My shoes fall apart every season. Every fall for many years I've been buying cheap shoes and regretting it! I have wide feet, so my toes always get pinched and the cheap plastic "leather" always looks horrible by the next year, making me have to shop all over again. Actually for awhile I've been buying the same pair of black shoes on Amazon just because I hate shoe shopping and I at least knew they would last me one season. This year I'm turning 31. And I'm tired of my shoes not fitting and falling apart. 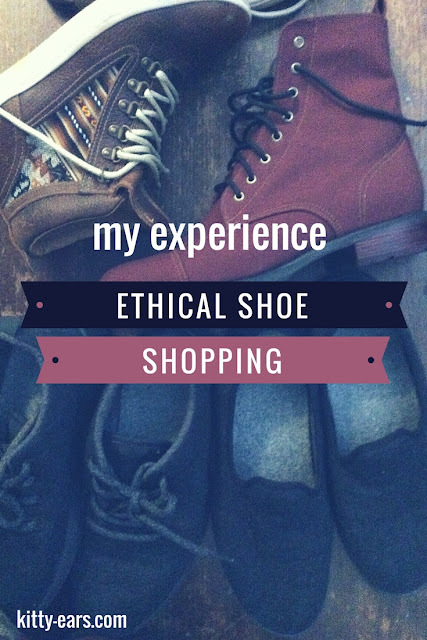 So, I decided to do something different: buy all ethical fair-trade shoes and see how they last, see if the quality is higher than my fast fashion splurges. I donated all but two pairs of my shoes (they were all falling apart/pinching my toes anyway) and decided to buy 3-4 pairs of shoes to replace them, giving me six pairs of shoes total instead of the nine pairs I had previously. I realize I could live easily with four pairs of shoes but I went a bit overboard... I don't really need three pairs of boots, but oh well. I also gave myself a budget of $500-700 that I saved all by myself from my YouTube money and Christmas/birthday money! And I researched each brand and came away with shoes that not only are extremely high quality, but that I LOVE. And they go with everything! In the video below I show some of my old shoes, the two pairs of shoes I kept, and the four pairs of ethical fair trade shoes I bought. Hope you enjoy!